Sheftali pl. Sheftalia are Cypriot oval shaped crépinettes, made with minced pork, herbs and spices which are then wrapped in caul fat and barbecued. A few months ago I told you how I made Cypriot Pita Bread and how easy it was to make. Ever since I learned how to make them we have been enjoying them in all sorts of sandwiches especially with halloumi and lountza or eating them with dips, like hoummous, taramosalata, tzatziki or melitzanosalata etc. However, one of the best ways to use them is to fill them in with sheftalia or souvlakia or both, “mixed” as we call them in Cyprus. Sheftalia were unknown in Greece until the 21st century, but after the internet, they are now becoming popular and you can find them sold in most supeermarkets. With Easter just around the corner, probably 99% of the Greeks will be barbecuing or grilling lamb ovelias (whole lamb on a spit) and kokoretsi or other food, as is the tradition. We always make some sheftalia as well. Today I would like to tell you how to make this Cypriot specialty. The origin of the word sheftalia comes from the Turkish word şeftali (kebab). However, the word şeftali means “peach” in Turkish. So how is this delicacy which is made with minced meat, spices and herbs be connected with the word peach? The word şeftali (peach), has its root from the Persian word şaft ālū , which means “fat berry”. So, this crépinette, which looks like an oval shaped meatball, wrapped in caul fat*, probably took its name by being compared to a fat berry or peach. The ingredients needed are: caul fat*, preferably from pork or lamb but they should be very fine, minced meat, preferably pork mince, lots of onions, lots of parsley, tomato, salt, pepper and some cinnamon. *Caul fat is the membrane that surrounds the stomach and is transparent, fragile, and naturally fatty, although when it is finally grilled or barbecued all the fat melts away, giving lots of flavour to the crepinettes. I cannot tell you exactly how much caul fat you will need because some parts of the membrane are thick and fat and only the transparent part must be used. Ask the butcher in your neighbourhood for it. In Cyprus you can also find it frozen in supermarkets. I do get some in Athens from my butcher but whenever we go to Sparta there is a big butchery and the owner has a big pigsty. Caul fat from pigs are better because those from lamb have a lot of fat on them and are more expensive. So whenever we go to Sparta I bring a lot with me (did I say a lot) and after washing them I separate them and store them in the deep freezer and use them whenever I like. Apart from sheftalia I also wrap stuffed meat rolls with the caul (instead of the phyllo). If you decide to make them, don’t add oregano because: it’s more like Greek meatballs or biftekia, don’t add cumin: it’s soutzoukakia, don’t add mint: it’s Cypriot keftedes (meatballs), don’t add rice: it’s dolmades, don’t add egg it’s something else and don’t use cooked meat, as I’ve seen that as well. When we first moved to our house in 1992, there was a take-away rotisserie just around the corner and I was so excited to see that he was selling sheftalia. I was already more than ten years in Greece and apart from a few Cypriot restaurants in Athens, you couldn’t find sheftalia anywhere else, so I hadn’t eaten any for a long time. The first thing we bought from this rotisserie were some sheftalia!! I was at first surprised of their size. Each sheftali was like a giant burger but shaped oblong like sheftalia. Needless to say that I never bought his sheftalia again but I continued buying other grilled meat as they weren’t bad. Months later when we got acquainted, I asked him where he learned the recipe and he confessed that he served his military service in Cyprus years ago but could not remember exactly how they were made, so he just improvised. If you ever visit Cyprus, you can find sheftalia in every neighbourhood, where there are small kebab shops selling souvlakia and sheftalia. They are served in Cypriot pita together with salad (tomato and cucumber or slaw, depending on the season), parsley and lemon juice. If you like pickles you should ask them to add some in your pita. Sheftali pl. Sheftalia are like oval shaped meatballs, which are wrapped in caul fat. Caul fat is the membrane that surrounds the stomach and is transparent, fragile, and naturally fatty, although when it is finally grilled or barbecued all the fat melts away giving lots of flavour to the crepinettes. Wash the caul fat well under running cold water and place it in a bowl, add the lemon juice and leave it for 10-15 minutes. Rinse and let it drain. In a large bowl mix the ground pork, onion, parsley, tomato, salt, pepper and the cinnamon. To prepare them, carefully unravel the caul fat and stretch it out over your work surface. Place a spoonful of the ground meat at the edge and fold in the outside edges and roll it once into a neat little package, shaping it with the palms of your hand, just as we wrap dolmades and cut it with a sharp knife. Thread sheftalia using two metal skewers, with 4-5 sheftalia lengthwise depending on the size of the skewers or place them inside a wire basket grill. 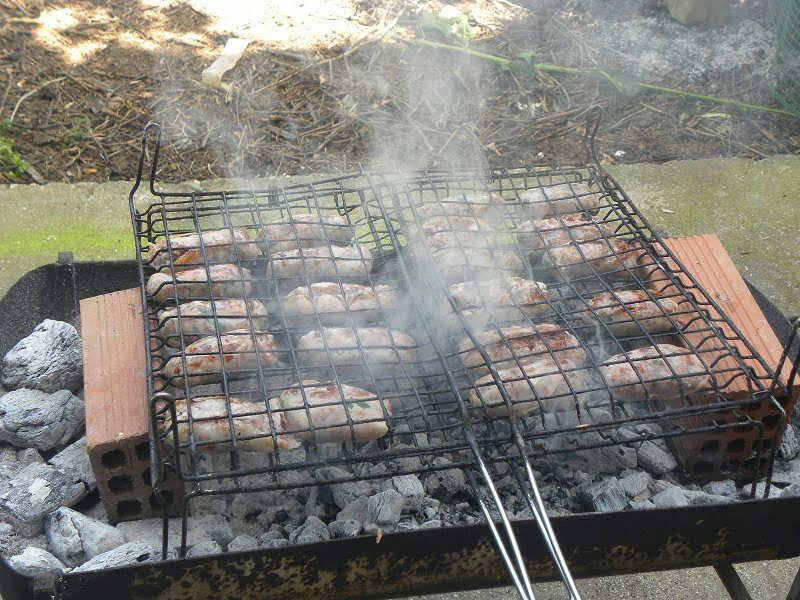 Prepare a charcoal grill, same as for souvla or souvlakia. Do not place too close to heat as sheftalia must cook fairly slow, so that the inside is well cooked and the outside nicely browned without being burnt. Grill around twenty minutes, turning the grill frequently, until the outside is crispy and dark. Alternatively, if you do not have an outdoor grill, you can grill sheftalia in the oven. Make a slit on one side of a pita pocket to form a large pocket and warm the pita bread on top of sheftalia, just before they are ready. Slide two to three Sheftalia off the skewer into the pita and add chopped tomatoes and cucumber, 1 tsp chopped parsley, as much chopped onion as you like and season with salt and a lot of lemon juice or just add tambouli and talatouri. Before barbecuing, sheftalia can be frozen for up to 4 months. Defrost before grilling. Our family owns four restaurants in Cyprus and you must know that in the restaurants we avoid adding the tomato as some people think the meat is not cooked properly. However, at home we always add it as it makes the meat tender and sweet. These look fantastic Ivy. Another great Cyprian find! Mmmmmm, I just bought some pita bread in the supermarket… never used it before… so your recipe is fantastic for me at this moment… maybe I fill it with chicken instead. Nuria, chicken with pita would be fine as well. Ben, if you ever visit Greece you will have to visit Cyprus as well (1 1/2 hour by plane) because half of my food are from my home country, which is Cyprus. I feel like I learn something new about Greek food everyday. This looks delicious! Cynthia, look who’s speaking. You make us drool when we read your posts but I would be so glad to have you over for dinner. Mike, it seems that you have a lot of Greek friends but we all learn new things from blogging. This looks so beautiful and tasty with the chopped veggie garnishes. I’m wondering where I can find caul fat, but I recently found sheeps’ heads (not that I wanted any) so I bet I might be able to find other interesting stuff.